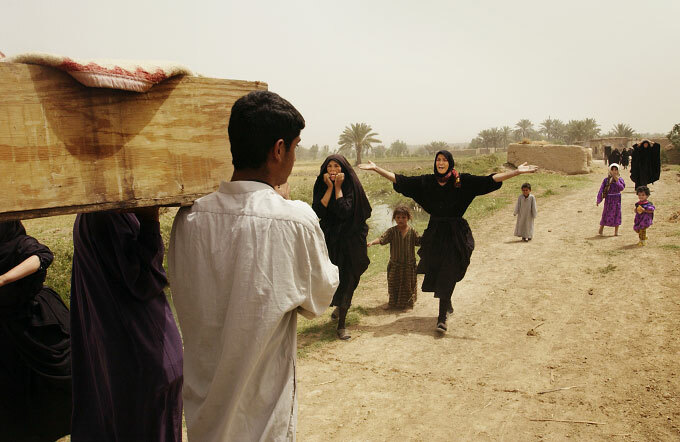 Family members wail and beat themselves in Shiite tradition as a coffin containing the remains of brothers, Naim and Fasal, is brought home for mourning. The two were killed when the regime of Saddam Hussein crushed Shiite uprisings in central and southern Iraq in 1991. Their bodies were secretly buried in an unmarked mass grave in Hilla which was exhumed for the first time tin May, 2003. The men's mother and cousins and widows searched for more than a week before locating their identity cards in clothing tangled in their bones.